After a few months of conceptualising, redesigning and coding the online photo checklist for the Butterflies of Singapore, ButterflyCircle is pleased to announce the new and revamped checklist is up and running. 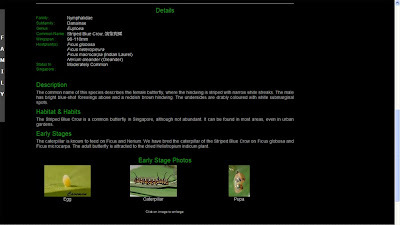 Whilst minor glitches are being tweaked, and more information will be added progressively, the checklist can now be used as a good photographic reference to identify butterflies that you've shot, or just to check information on species of butterflies found in Singapore. The revamped ButterflyCircle Checklist features a professional-look with black background and an attractive layout featuring some of the best shots of the species taken by ButterflyCircle members. 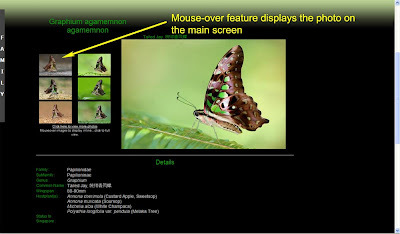 For a start, the new mouse-over feature at the menu bar allows a user to select the families via a click of the mouse on one of the six butterfly families featured in the circular graphics. Users can select an option of viewing the checklist in a Grid format, or a List Format, depending on personal preferences. Place your mouse over the sidebar "FAMILY" to get a slide out menu for more options. For users with extremely slow access, a non-graphical checklist is advisable and this can be viewed by clicking on the word "CHECKLIST" at the top of the screen. 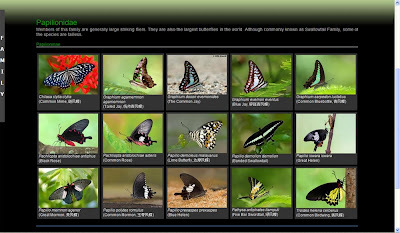 For details of a particular species, click on any of the photos or names of the butterfly species, and you will be brought to a new screen showing a larger view of the species, as well as other photos (where available). A neat feature with the mouse-over allows a user to view a larger shot by merely placing your mouse pointer over the other photos. Where available, more photos can be accessed via the "Click here to view more photos" link. 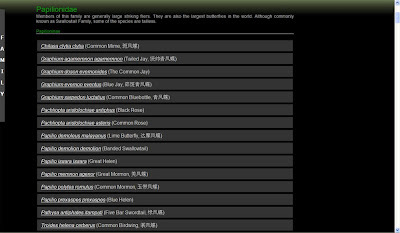 Below the photos, are the write ups and details for the particular species. Also, where available, early stages of the species are also featured, showing egg, caterpillar and pupa of the species selected. 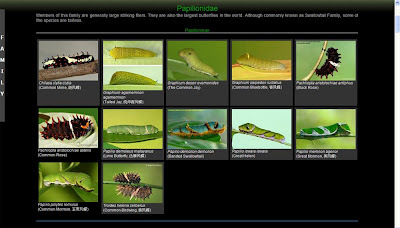 For users who have shot a caterpillar or a pupa, and who want to search graphically, click on the links for "Egg", "Caterpillar" or "Pupa" at the menu at the top of the page, and you can view the photos of one of the three early stages in the Grid format only. The list also features the host plants which will progressively be populated with pictures and more details of the host plants. ButterflyCircle hopes that you will find the enhanced online checklist useful. However, please be reminded that the photos in the checklist are the work of our members who own the copyright to the photos. Please respect their copyright and do not use the photos elsewhere, whether for commercial or non-profit purposes without the approval of the photographer. 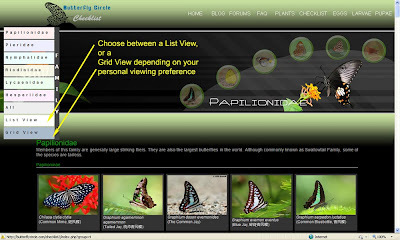 The content available on or through ButterflyCircle’s website and checklist, including but not limited to all text, graphics, images, or other files, as well as their selection and arrangement, (collectively, the "content") are protected by copyrights, trademarks, or other proprietary rights or laws. All such content is presented as a service to users of ButterflyCircle or its members and may not be copied, distributed, republished, downloaded, displayed, posted, or transmitted, in any form or by any means, without ButterflyCircle’s or the copyright owner’s prior written permission, except that such content may be viewed, downloaded, printed and distributed for your personal, non-commercial use. Any copy of the content or portion thereof must retain all proprietary notices of ButterflyCircle’s or the copyright owner. Any other use of the content from this website without ButterflyCircle’s prior written authorization is prohibited.